#19 Mamima Heart Made, a photo by mamima project on Flickr. 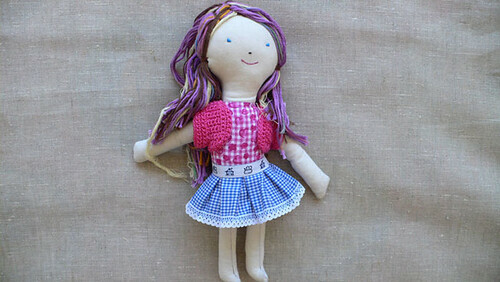 We are pleased to HUG you with the #19 doll from Mamima handmade collection. This is the Sara Mamima pattern with approximately 26cm L x 7cm W, just the right size to carry around wherever you go. The body is made on fabric and poly filled. The hair is stitched to her head. The eyes, the mouth and the nose are embroidered, so no loose buttons. The clothes are removable, made of fabric and knitting. Is resistant to kids care and makes a great gift for children. The Mamima dolls will bring you a huuuuuuuuge HUG and a happy smile.